The war on humanity took its toll when a rogue faction was given life in the flames of nuclear fire. After escaping the war the rogue faction formed together and became a united force. Lying in dark space, they have created monsters of technology. Their true numbers are unknown since they reside in dark space. All that is known are their warships, units, and advanced tools of war. 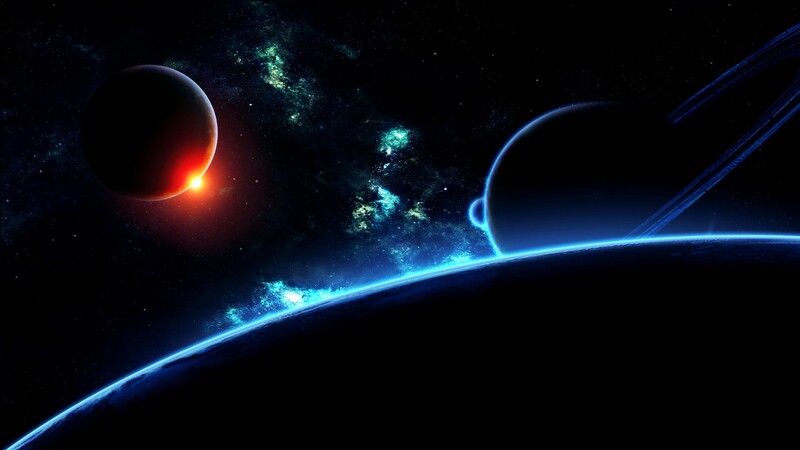 The faction is comprised of several Companies(estimates are around 10,000,000 Companies), these companies are stationed around the universe in dark space. Each Company houses 1,000,000 genetically altered soldiers(Winter Rebels, also see Winter Rebels below to view gear and enhancements.) they are carried in mechs(The rebels do not use space ships since they have no home,) known as Leviathans, and have an estimated 22k of them per company. This faction also employs the use of the Diclonius race aka forcers(see more info below). They will fight for who ever has the most money and technology, and will change loyalty in a heartbeat. They are not loyal to the unity unless hired. Augmented human, super soldier, Blood Raged. These terms come to mind when brought up in discussion. These super soldiers can take on a thousand to one due to their armor and enhancements. Limb fortification: arms and legs have enhanced muscle and nanites within them to lessen the possibility of injury or dismemberment. Extra lungs: 2 more Lungs are implanted within, able to filter out toxins and breath without a helmet with respirators on. Acid spit: self explained but only high ranking officers have this. Adrenaline overload: the rebel does not feel pain, nor emotion. It is the perfect soldier. 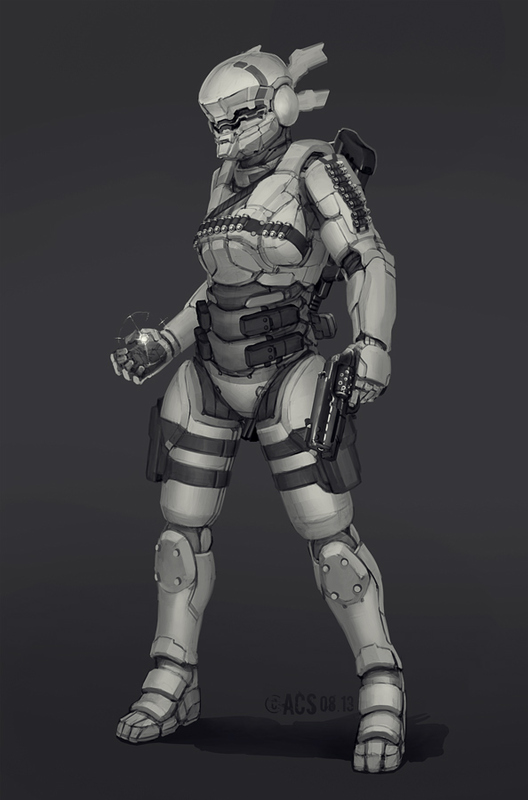 Synthetic spine: the original spine was removed and replaced with a synthetic one that is not durable and connects to the armor via needs. Nocturnal vision: the eyes are able to precise thing in the dark that a normal being would not. This eliminated the need for night vision in the helmet, but it is still installed due to some subjects that are unable to cope with this enhancement. Synthetic bones: bones within the body are removed and replaced carefully with a synthetic mold and flexible metal. Enhanced power armor: 6 inches of titanium armor in the front, 12 inches on the back, 3 inches on the sides. Armor stands at about 7-9 feet tall. Nano pack: a small 1x1x1 (ft) backpack that has accessories such as radiation packs(dispenses lethal radiation behind where ever the rebel walks,) and toxic packs(same function as radiation pack.) the nano pack hooks up to the armor and connects to the spine. It releases bone marrow(to compensate for lack of bones), and nanites into the body. Some rebel add the jet pack feature on their packs but it varies. Power armor enhancement: increases strength even further and allows faster running. Cloak: ability to turn invisible and muffle and sound caused by them. Target finder & AI: target finder paints targets and marks mission objectives, cover and cover level(basically saying if it is reliable or not). It directly feeds a live stream to the leviathans. 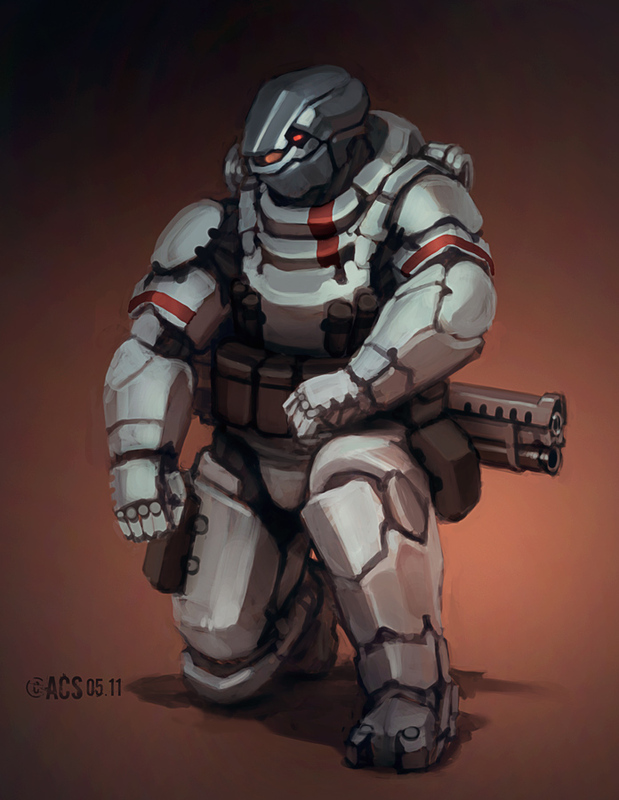 AIs are assigned to each rebel, they basically operate and maintain the armor so the rebel can focus on combat. They update the rebel of enemy movement on the radar the target finder has. Spike grenades:nanites are stored in grenades and eat every thing in every direction for 10 seconds after denotation. ASM: Assault shielding module. This is on the left arm of the rebel. 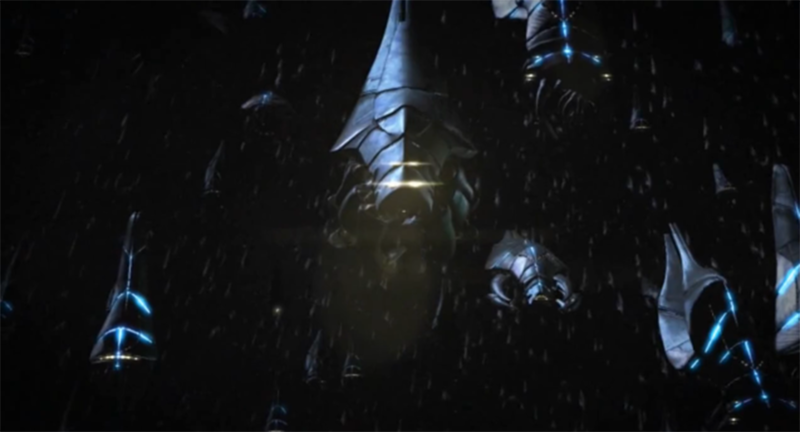 It activates an energy shield infringement of the rebel that covers the entire rebel if crouched. Can be broken by normal gunfire but extremely durable. Plasma custom action gun: a pistol that has add on parts that can transform it into any of the following on the battlefield with ease: smg, LMG, HMG, Rifle, Sniper. Spike launcher: functions as an RPG using spike rounds, it can lock into targets. Plasma Knife: 12 inch blade, when activated, the blade edges have plamsa on them. The rebel armor is never removed, they are always ready for battle. A spear like object but noticeably thicker. 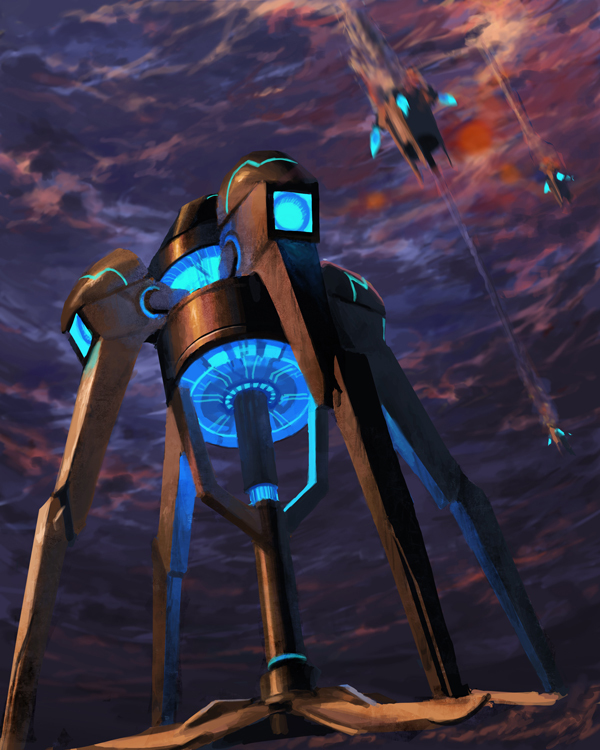 They are 10 feet tall and the top expands, next troops and mech(including Leviathans(ten mile high mech) teleport through. 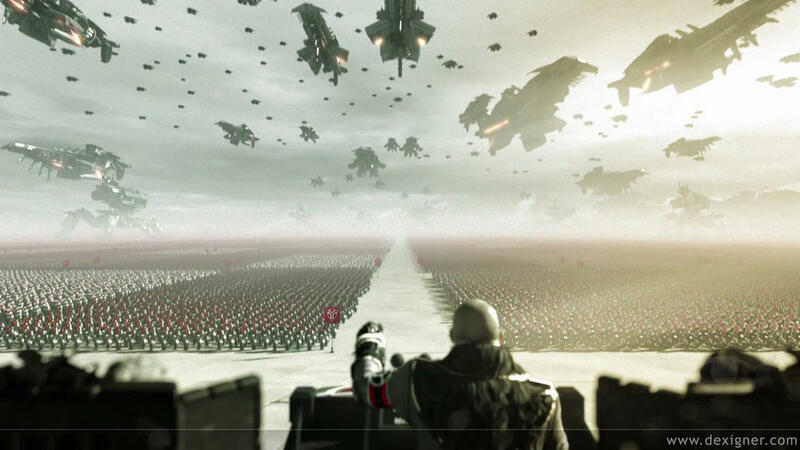 These are sent in mass numbers so that once troops are on the ground they can evade fire, flank, and/or avoid detection with ease, all the while the AI handles it, allowing the rebel to virtually dodge bullets, unlike a normal troop.they can be used for ship to ship action. The Diclonius race is a mysterious one. It can not be described through simple words. (Truly I can't explain them but they are in Wikipedia, type in Diclonius) they are human but have horns(more like stumps of bone visible above the skin) their vectors move through anything and nothing but another Forcer can combat these vectors. The vectors can stop fire, throw objects, cut people in half and dismember them slowly in laughter. They use their vectors to "float" when in reality the vectors are holding them off the ground. The vectors are somehow come yes to the horns and all that is known is that it operates similar to hyperspace. Basically a Forcer is an organics hyperspace drive that kills in mass numbers. A Forcer's vectors can move through objects like a ghost if it wishes to but it change it's vectors to affect what ever it touches in a heart beat. Every Forcer has 4-1000 vectors and their lengths vary. Forcers are pilots of fleets and ships. They are also I every squad. They carry a unique revolver and can form vector duplicates if they chose to. Sergeant-commands 100 Winter Rebels or a squad of 6. Leviathan(they look exactly like a reaper from Mass effect) these mech are ten miles high. 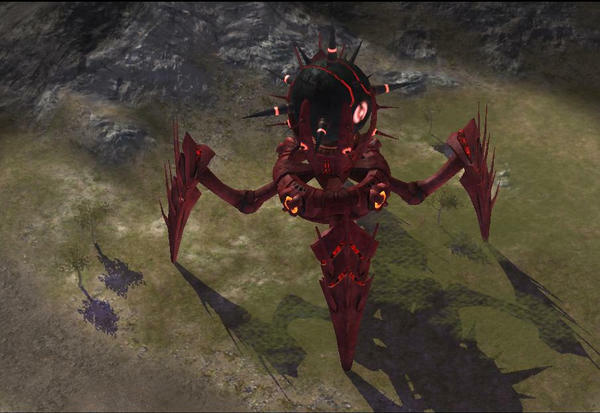 They always face your with their bottom since they land on planets under siege and immediately set out to kill. They are armed with many SHPMAC(Super Heated Plasma Mass Accelerator Cannon) radiation canisters and toxin canisters. They have no need for bombs the cannons are enough to destroy the largest of warships. Their bottom armor is 300 meters of titanium (the top is the weakest part but is still incredibly strong) antigravity fields and 5 different forms of FTL, hyperspace, teleportation, warp, sling shot method, and the jump gate that flies around with every fleet. A white mech that is controlled by a quantum super computer AI, each one is considered alive.they have no head since an optional cockpit is in the torso. They are heavy mechs with ordinance that is unbelievable, to simplify it I am breaking it down into sections. 4 linked plasma miniguns(can be swapped for 4 linked spike launchers), like always the Winter Rebels have perfected plasma and this weapon will run a continuous beam and never over heat. It can adjust its fire without moving the torso. On the back is a massive Rail cannon(or MAC) that the mech will reach behind and pull down across it's shoulder. This acts as artillery an the firepower is so devastating the mech must plant its feet and brace itself or else the torso may split in two. It has a plasma thrower torch in the palm of its hand so it can burn the victim that it has picked up. Under its arm is a spike grenade launcher(500 grenades) and flair system. The legs can plant in the ground, there are only 2. They are thick. Has auto sentry guns on the knees that can pick off infantry up close trying to plant a bomb. On its rear it may carry a nuke or 5 mini nukes as grenades. They are small spheres that are no bigger than 3x3x3 feet. They are controlled by VI installed on the ships. They re also like bombs in a way since they can kamikaze into fighters and warship, causing considerable damage. They have 2 plasma guns on them and fly at high velocities. A mech that is 5 stories tall. It is our WMD. All we need is a sample of any race, organic or synthetic, and the world can be considered doomed. It sends out an energy spike that is directed to that species coding(organic or synthetic) and wipes them off the face of the world entirely. This tech could be used on a galactic scale but it is to big to try and explain if it was a failure. It has a Teleshield, a shield that when fire hits it it will just come out the other side, the only way to disable it is by destroying the Forcer who controls it from space. 1 out of every 100 companies has these tripod mech. The power fist is worn like a glove, and can punch through the thickest armor with ease. Equipped on both hands, these weapons are the new favorite of troops with Jet packs. It spreads terror and makes enemy troops panic. Not only are they fists, but upon contact, Explosive buck shells are fired. This is so that when the fist punches through power armor or flesh and bone, extra damage is inflicted on the target and pushes the target back, reducing the time needed to recover into a ready stance for the rebel. There is rarely a survivor from this weapon, and so far no survivors are reported from testing on the field.